Our Lab founder, Belinda Ferrari, featured in a shout out to all the women who play a crucial rol in the Australian Antartic Program. Trash Talk is the 7-part mini-series from Trashy Science where they show the science and humans behind sustainability. Sally was invited to talk about cleaning up oil-contaminated Antarctic soil using the local bacteria. 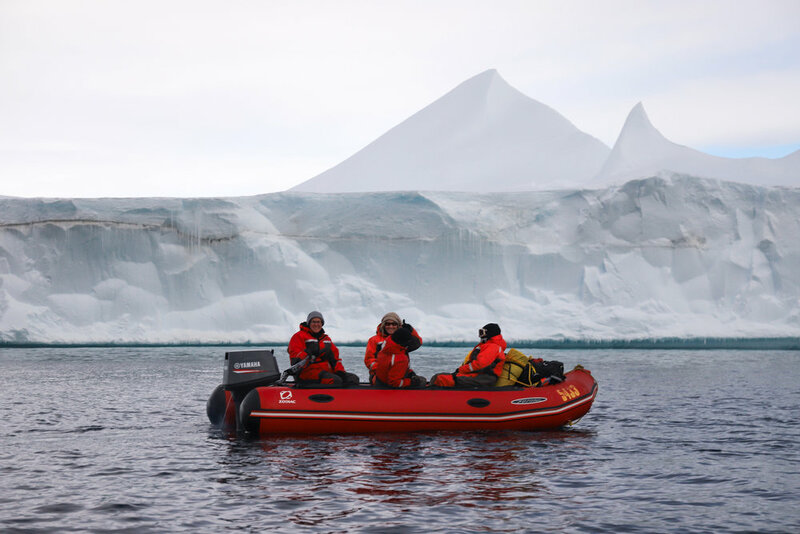 To our excitement, after a hard day of sampling at Mitchell Peninsula, we found ourselves in a flurry of activity and managed to snag a spot on a boating trip amongst the bergs at Casey - blessed the weather. Boating in Antarctica is a very part-time activity. Within that short summer window, most days are unsuitable because of wind: anything stronger than 15 knots makes it cold and raises waves, and the whole thing gets uncomfortable and dangerous. Adelie penguins on a berg. Belinda on a boat with Cath as coxswain. Matrix of blue and white. Saving the hardest for last, Browning Peninsula is located approximately 3-4 hours away via Häg from Casey (2 hours with Cath’s driving). Long road trip out to the sampling site, very bumpy but still managed to catch some ZZZZs in the Häg. Whoever designed the interior layout of this field hut needs to reconsider their day job. We somehow managed for 4 days without showers and in close proximity to one another - thank goodness your sense of smell is diluted down here. Beautiful but slightly treacherous location and close to wildlife (Elephant seals). First time having to equip ice chains on the baffins as we hiked across to our sampling site located approximately 500m NW from the hut. Weather was crappy, sieves wouldn’t dry, MilliQ was frozen, wildlife stealing our 50ml tubes and not enough bowls for delicious tuna-chicken (?) dinners. Many challenges but a worthwhile experience. Had to prioritise some samples during collection but managed to get 3/4 of them - better than expected, less than planned. Traversing across the terrain, about 15min one-way to sample 7 distance points then back again. Sieving the subsoil using a 4.75mm stainless steel sieve. Dried algae around the large cobbles. Only a 30min Häg ride from Casey, sampling at Mitchell Peninsula was completed within 2 day trips. Weather is taking a turn, with wind chill down to -5oC. A windy and rather steep start but eased off later during the day. Sea ice is quite dynamic here and also the reason we couldn’t park close to the sampling site, entailing a short walk carrying our equipment across snow. Nice view though. Sampling was completed with no major issues thanks to help from Mark and Bec. Blue and yellow Hägs enroute to sampling site. View across the bay whilst sampling. Stunning copper ore veins in the local rocks. 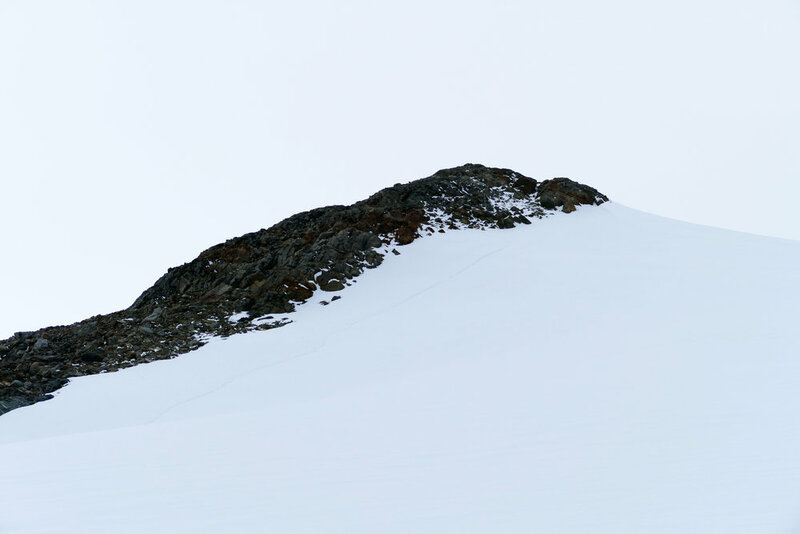 Located approximately 1 hour via Hägglund from Casey Station sits Robinson Ridge, our first sampling site. Ferrari project arrives to resample the long anticipated soil biodiversity transect. Whoever thought that 300m could seem so long? Perfect conditions for sampling. Warm day, 0/8 cloud, winds less than 5 knots. Team cracked on to 10:30pm sampling, then returned to hut for wine and cheese dinner. Ferrari project had brilliant conditions yet again, transect sampling complete by 6:50pm. Retired to hut for wine and veg tajine, then walked down to water. No whales. No seals. Lovely though. First timers most impressed. Ferrari project unable to depart until 2nd Häg arrives from station so that we can comply with new SOP’s —> NO NAUGHTY EXPEDITIONERS ARE ALLOWED IN THE REAR OF THE HÄG. Anticipated departure close to lunch. View of Robinson Ridge from the hut. 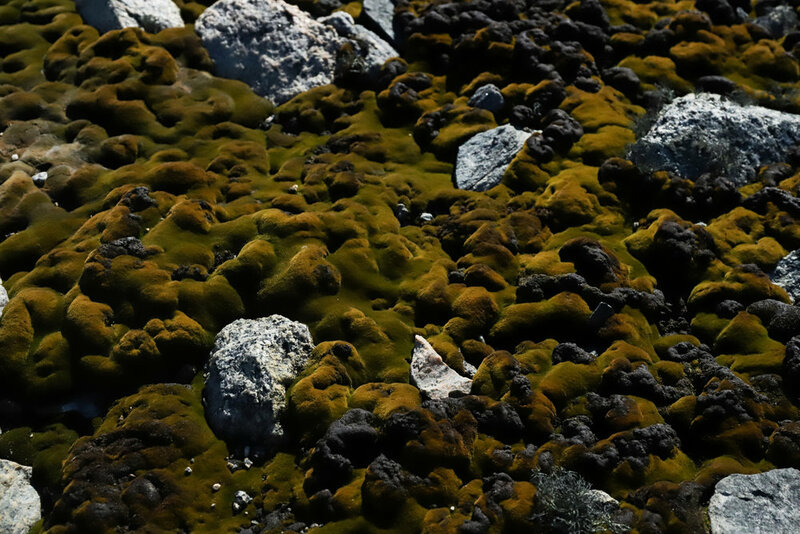 Black encrusting lichen on the rocks. The overall aim of AAS No. 4406 is to understand how atmospheric chemotrophy supports primary production and drives microbial community structure in eastern Antarctica. We resampled three remote locations (pictured below) using the same geospatial design and diversity assessments. The purpose of the activity is to collect soil for analysis back in Australia as part of a decadal plan to monitor community shifts and potential effects from global change between 2005 and 2018 at three sites in the Windmill Islands. This research will challenge our global understanding of the biological sciences, as a new strategy for survival at the nutritional limits of life will be described with ramifications for understanding global hydrogen and carbon cycling. Belinda Ferrari, from a bored country kid to a microbiologist who discovered bizarre new lifeforms. Read more below!